Will be the most popular chair in the house! The amazing Hammaka is one of the most comfortable chairs on the planet! This hanging hammock chair cradles the body with near perfect pressure distribution allowing hours of relaxation without any repositioning or movement at all. Easily hung, the Hammaka is commonly used inside the home or office as well as outside on the porch, poolside, camping, sail boating, at the cabin and virtually anywhere you can hang a rope. There are similar products but none of them compare in quality or price to the Hammaka. The Hammaka comes complete with armrests, an inflatable adjustable pillow, an ottoman and a drink holder. 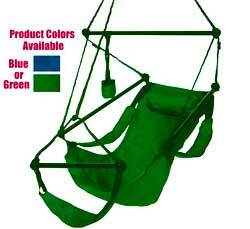 The Hammaka is available in Forest Green and Navy Blue. Unlike canvas fabric that is less durable and will mildew in many climates, the Hammaka material is a manufactured nylon with a UV inhibitor for long lasting comfort. Simply stated, your Hammaka will be the most popular chair in the house!